The Bakers is a pub on East Road with a large back room and outdoor seating. It is popular with ARU students. The pub was formerly known as The Noble Art, and prior to that The Bakers Arms. 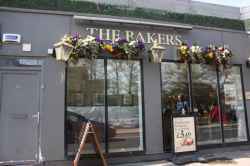 Based in East Road, Cambridge, The Bakers is a bar. The Bakers is in East Road Cambridge. You can view a list of neighbouring businesses by going to the East Road page. Note: the pin is positioned at the postcode centre, and may not correspond with the precise location of 176 East Road.